The rose is native to the United States. In fact, there is a fossilized rose imprint in a slate deposit in Colorado that is estimated to be 40 million years old, according to scientists at Texas A&M University. The rose is The United States' national flower as well as the official state flower of four states and the District of Columbia. The rose can be grown in most USDA plant hardiness zones, depending upon variety. Propagation of roses is easy, and there are a number of ways to reproduce your favorite rose, including grafting, seeds and cuttings. Be sure that the rose you are propagating is not under patent; asexual propagation of a patented variety requires a license from the breeder. Choose a stem from the rosebush. It should be one that has already bloomed. Cut a 6-inch length of the stem, at an angle, where the stem joins the larger branch. Cut the other end of the stem straight across. This will be the top of the cutting. Remove all the leaves from the stem. Moisten equal parts sand and peat moss until the mix is uniformly wet. Pour it into the pot and, using your finger or a pencil, create a hole in the soil for the stem. Dip 1 inch of the angled end of the stem into rooting hormone and tap it gently on the side of the jar to remove the excess. Insert that end into the prepared hole and bury half of the stem in the soil. Use your hands to tamp the soil around the stem. 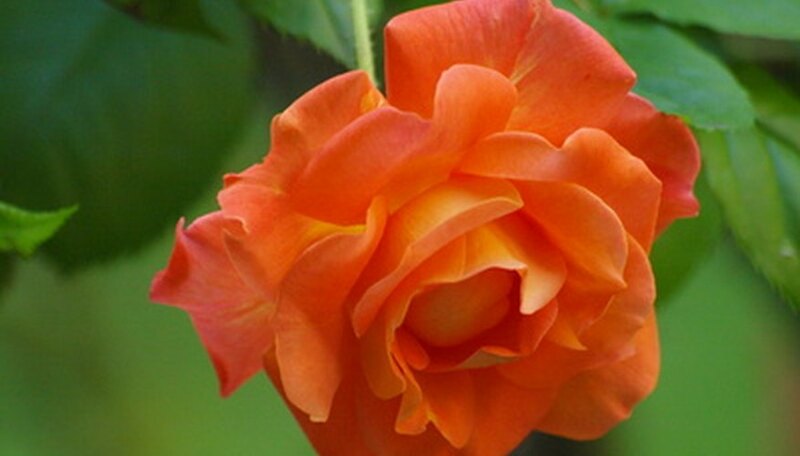 Place the potted rose stem in a shady area and keep the soil moist but not soggy. Mist the stem daily with water from the misting bottle. The stem should root within two months.